Ten years ago, the founders of Swift Green Filters saw the handwriting on the wall. They recognized that lead and other harmful substances were present at varying levels in the public water systems in the US. Their goal was twofold: to be the first after-market replacement water filter company to produce a filter that would remove up to 95% of lead and other harmful substances, and make it environmentally friendly. They succeeded and are not only a leading producer of water filters for consumer refrigerators, under sink water systems, and commercial beverage dispensing systems, but are also the only aftermarket supplier of filters that remove lead and other chemicals. Lead leaches into water from lead pipes which are common in old buildings; removal of old pipes is costly. Add in antiquated public water treatment systems and improper or inadequate water testing procedures and tragedies like the water crisis in Flint, Michigan happen. Swift Green uses coconut shells as a natural substance to make an alternative activated carbon. “Coconuts are grown in 80 different countries with a total production of about 61 million tons per year. After use, the shells are often burned or discarded into the ocean. We are recycling these shells instead for use in our filters,” said Suri. 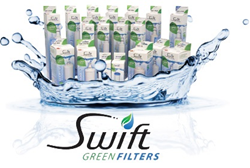 The production warehouse for Swift Green Filters in Manning, South Carolina, is working at full speed to keep up with the demand for their water filters. The dedicated employees of Swift Green know the value and importance of their product -- not only to the US, but to the world.